A sophisticated practical addition to any office, a Desk Blotter will invite a sense of refinement to your workspace. 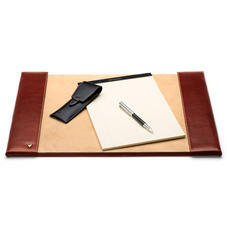 The solid cedar frame is lined with suede, providing a sturdy yet comfortable writing surface. Bound in superior leather by our own master craftsmen and women, the folded edges deftly conceal a row of handy business card slots to each side, ideal for keeping your most important contacts close at hand. Available in classic black, rich cognac or luxurious Amazon brown mock croc.